"All the business of war, and indeed all the business of life, is to endeavour to find out what you don't know by what you do; that's what I called 'guessing what was on the other side of the hill. '", reminded Field Marshall Arthur Wellesley, the first Duke of Wellington. To achieve the 'what-you-do-know', the Duke didn't guess; instead he employed spies in his war with Napoleon on the Iberian peninsula. In the field of economics, we don't have to be as crafty as the Duke. It's enough to rely on just three easily available indicators to know the true state of the economy. Even our indicators should be as simple as possible. The more indicators and the more complex they are, the greater the possibility of us being lost in the mass and confusion of details. For example, most economists rely on the M1, M2 and M3 metrics to measure money and when they couldn't correlate those metrics with inflation, deflation or GDP, they tweak them by using moving averages that cover several months' metrics. If only they had used total credit, the trend would have been obvious from the start. Not only in the economics profession but also in the business world, the increasing trend towards dependency on a multitude of charts and indicators is numbing most of our senses. Thankfully, there are still pockets of expertise in which human senses are still valued. A good test of a ship captain is whether he can navigate the vessel without the use of any instrument. His judgment of bearing, distance and speed must be sound. Similarly, a good manager can quickly sense the state of employee culture by simply observing the workplace environment or he can tell whether a factory is making money by just walking around the factory floor. If he were to wait for an employee survey or a production report to discover the answer, that would badly reflect on his competence. We have already reviewed two of our three important metrics: the total credit and the Case-Shiller 20-city composite home price index. The last metric in our list of indicators that matter is the Labour Force Participating Rate (LFPR). I only discovered the importance of this metric when searching for the cause of the protest movement in the US that emerged in the mid 1960s and lasted until the early 1970s (see 'The protests, 45 years on'). To understand this metric, we need the big picture on the labour force. A recent issue of The Wall Street Journal has an excellent graphic at left that puts the various civilian population components in their proper perspective. The US population in this context includes all members of the population aged 16 and over. Unlike the LFPR in other countries which covers only the working age population, the US LFPR also includes those above 65. 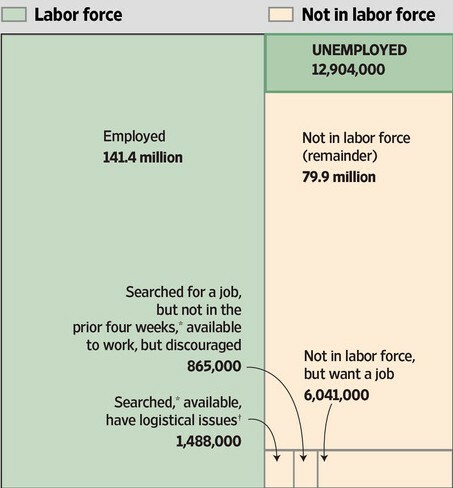 A major part of this population participates in the labour force, whether employed or unemployed, as depicted by the two green boxes. Unemployed here means they are in search of jobs in the four weeks prior to the labour force survey. There is also a smaller category of people which by choice or circumstance does not form part of the labour force. These people are permanently not in regular or part-time employment. They also include those who have stopped searching for a job in the past four weeks prior to the labour force survey. These various categories are represented by the cream coloured (or pinkish hue) area. Now the main issue here is why we should rely on the LFPR instead of the employment or unemployment numbers. Let's bring up the unemployment chart. 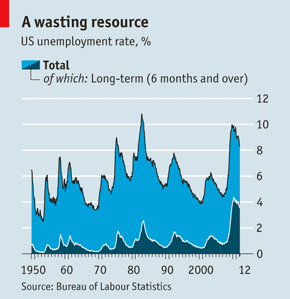 This one from The Economist at left shows that there is no obvious pattern that can be discerned. Can you predict how it's going to unfold in the coming months or years? Almost impossible; there's an equal chance of it going up or down. However, one pattern that sticks out like a sore thumb is the long-term unemployment line graph which accelerated sharply since the start of the current recession in 2008. Although past unemployment rates had been higher than the current rates, the rise in past long-term unemployment was modest. That should've alerted us that this recession is atypical and that the unemployment now is not cyclical but structural. 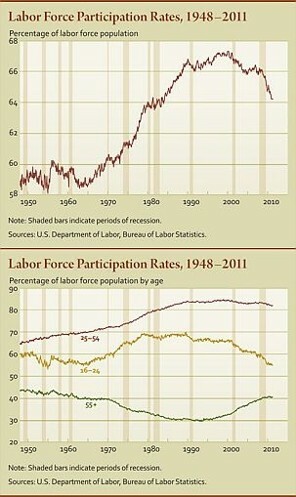 Let's take the LFPR chart, from The Wall Street Journal, that covers the same period as the above unemployment chart. Note the obvious difference between this chart and the previous. With this chart, you'd have no problem predicting where the line is heading. Because the line graph in this chart cannot turn on a dime, you can figure out the turning point months ahead. Now we can explain the movement in the labour force components shown in the first chart. The movement between employment and unemployment, i.e., the two green boxes, is pretty fluid. It can go either way depending on the state of the economy. But the shift between the green and the cream areas can only be unidirectional. As a result of this one-way traffic, the unemployment rate can be showing improving metrics even though the job market is deteriorating. When the unemployed give up looking for jobs, i.e., become non-participating, both the numerator (the unemployed) and the denominator (the participating labour force) decrease. Thus the improvement. In the case of the LFPR, the same situation would reduce the numerator (the participating labour force) while keeping the denominator (the aged 16 and above population) unchanged. Thus the declining LFPR. Note that a lower figure is good news for the unemployment rate but negative for the LFPR. We can use the analogy of reverse osmosis (RO) to explain why the flow is one way. In RO, two factors cause movement from one side to the other: pressure and concentration. Right now in the green area, the pressure, to cut costs through retrenchment, is so strong that the movement is mostly from green to cream. Businesses are relying on technology to cut headcount while maintaining production at the same or even higher level. At the same time, a high concentration of baby boomers (those born in 1946-1964) has started to retire (see left chart from The Economist). So over the next 18 years, the baby boomers will migrate in a big wave to the non-participating section. But the interesting bit about the declining LFPR is the cohort that is disproportionately hit is the one in the 16-24 age bracket (see lower panel of the LFPR graphic above). What most of those in this group have done is to take up additional study loans to further their studies hoping that by the time they graduate, the job market will have improved. How they're going to be utterly disappointed. They'll soon realise that they're jumping from the frying pan into the fire. The job market will still be moribund but worse, the loans that they've burdened upon themselves will take years to repay. However there are others who, faced with this inextricable situation, plead disabled in order to claim disability benefits. In fact, disability claims have increased significantly during this recession, up by 22% since December 2007. There are also instances of those committing petty crimes in order to get free food and medical in jail. Funny that the losers in the monopoly board game also would find much relief when they get sent to jail. At least, in jail, you get sheltered from the economic horrors of the real world. This final chart at left from dshort.com is presented just to prove that any indicators that include employment or unemployment as its numerator or denominator can be safely ignored. The blue graph is the employment-population ratio while the red is the unemployment rate. Since employment and unemployment are two sides of the same coin, the two line graphs are just mirror images of one another. So with indicators as with anything else, less is more. The simpler, the better. The quicker you can grasp the pattern, the greater your ability to predict future trends. Least of all, you don't want to appear silly like Donald Rumsfeld with his known unknowns and unknown unknowns.